This is the draft of my article about Yosakoi festival, which I wrote for a Singaporean magagine in 2006. I think, at this point, this is the best and most concise write-up that I can provide about this crazy but wonderful festival. The final version of this article was included in ASIA! 2006 Issue Ten after a few editing. Oh, and ingore the date of this post. I just put the oldest date of 2004 so that this does not pop up in my regular posts. “Hold the naruko clappers with your thumbs and index fingers, then …” The first practice of a Yosakoi dance typically starts with this instruction. Here in Kochi, a rural city on Shikoku island in Japan, we have a big outdoor dance festival, called Yosakoi, held annually from August 9th to 12th. During these four days, more than a thousand dancers in dazzling costumes dance through the streets, accompanied by music that vibrates their spines. Even the crazy summer heat and sudden downpours cannot stop these dance nuts. The festival started in 1954 to cheer up local people and boost the economy. The name Yosakoi is said to mean “welcome” or “Come to me at night.” An original dance, song and wooden clappers were devised for this festival. But the standard music could be altered, and soon participating dance teams started arranging this classic version of the Yosakoi dance into whatever style they liked, from hip-hop to hula, attracting many younger participants. Now this dance festival is a huge event with more than 170 teams from all over Japan participating every year. You see dance parades with 30 to 150 dancers per team following a decorated truck with amplifiers, booming out live and recorded music. The fusion of tradition and creativity has always been the theme of this festival. 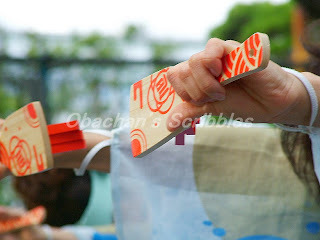 To pass down the tradition, several rules were made including the requirement to use wooden clappers called naruko, and to include a phrase from the original Yosakoi song in the dance music. Meanwhile, instead of repeating the same performances for years, dance teams struggle every year to make new routines, music and costumes. Enthusiasm for Yosakoi spread like wildfire and Kochi teams traveled around Japan to share expertise, and create new Yosakoi festivals, which are now held in more than 200 locations in Japan and even abroad. But increasing popularity has brought its own problems. The media has made other Yosakoi festivals more popular than our own, and the styles dominant there have set the tone of Yosakoi to be more like a big dance contest for those who can perform fast, energetic dances. For many of us in Kochi, Yosakoi has to be a festival where anyone can join in and have a good time. Here we can see the elderly and even kids who perform slow and really charming dances. Here the “classic” version of the Yosakoi dance is taught as a reminder of how it all started, and also as an easy routine that spectators can learn on the spot, and join in during the dance parade. We have our idea of the beauty of Yosakoi dancing, but we are not too fussy about it as long as the dancers truly enjoy themselves. That is our Yosakoi. After all, it is a never-ending struggle to pass down our culture and keep Yosakoi the most creative, diverse and traditional festival in Japan. And we are willing to struggle because for us, summer would be nothing without Yosakoi.